As a first time employee for BIO, I’ve learned a great deal and had many first time experiences over the past two weeks. From learning how to tissue sample to my first time writing a blog, almost everything has been new and exciting. I have to go through all these containers! My name is Josh and I’m a second year student working predominately under BIO’s resident arachnologist. The project I’m currently working on is maintaining and inventorying his two fluid lockers which are where most, if not all, of BIO’s arachnids are archived. Unlike many insects which can be pinned and stored in dry lockers, spiders need to be preserved in ethanol – hence the name, fluid locker. Over time, this ethanol evaporates and leaks through small gaps between the container and lid, meaning that if left unchecked, the spiders can dry out and become damaged. This is where I come in; I’ve been tasked with adding ethanol to the depleted containers and in the process, I get to see some very neat spiders. Once the ethanol has been added, I tape the seal using stretchy tape called “Parafilm” which acts as a barrier that inhibits evaporation, meaning that this routine maintenance needs to be done less often. The second part of my job is assisting the collections department with any tasks that need completed. I usually spend the first hour or so in the collections department tearing legs off of arthropods. This is called tissue sampling – a part of the specimen (usually a leg) is removed for future DNA barcode analysis. Some of the specimens are no larger than a tack making some of the legs very difficult to remove. Trying to retrieve a single leg without damaging the specimen is like a strange version of the board game, “Operation”. To add another dimension of difficulty to tissue sampling, there are certain legs you can and cannot remove for certain groups of organisms. For example, on flies, moths, and beetles, the ideal leg to take is the middle right leg. On spiders, you can take any leg but those from the first set which are used for copulation. On caterpillars, you can take any of the “true legs” but not the prolegs which although aren’t regarded as legs, closely resemble the caterpillars true legs. The challenge of it all and the fact that I get to see tons of interesting insects and spiders makes tissue sampling really enjoyable. Although the office work is great, I’ve really enjoyed being out in the field over the past two weeks. 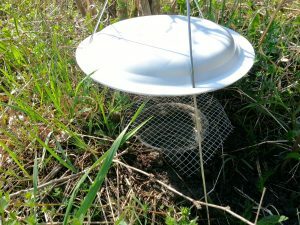 I was part of an ongoing program that involves BIO staff heading to the rare Charitable Research Reserve every Thursday to service our malaise and pitfall traps. If you’re ever walking through and see a tent-like structure with a bottle attached to its front, that’s a malaise trap. Flying insects fly upwards towards the white part of the tent and ultimately get trapped in a bottle of ethanol which we take back to BIO and analyze. Hidden on the floor surrounding the malaise trap, are three pitfall traps. 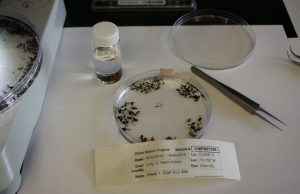 Land bound insects unknowingly walk into our traps, fall into the jar of ethanol, and can’t get back out again. Both times I’ve been out the weather has been great and here’s hoping it stays so. My name is Shannon and I am a fifth year Zoology student lucky enough to be part of the team at BIO this summer. Officially, my job is titled “collections processor”, but unofficially I’d like to think of myself as more of a bug doctor. Part of my day at BIO is spent performing check-ups on the bugs, inspecting them for damage after they have gone through the barcoding process (this is what we call voucher recovery). 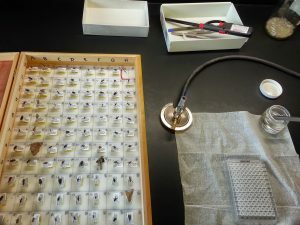 My job also includes performing bug leg amputations on some of the larger specimens for tissue sampling. However, doctoring bugs is not the only part of my job. Sifting through this week’s specimens. This collection of bugs was sent to us from St. Peter’s School in Unity, Saskatchewan. This past week has been a busy one in the Collections department for the BIO team, filled with receiving, sorting and counting all of the submissions from the School Malaise Trap Program. 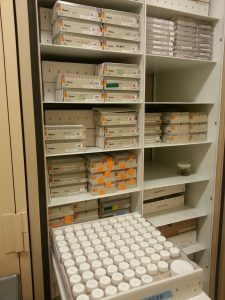 The School Malaise program is a program designed to let kids from all over Canada participate in one of the most important steps in BIO’s research: collecting specimens! With insects thought to make up over 85% of all animal life on Earth, and our goal being to barcode them all, everyone’s participation is well appreciated. 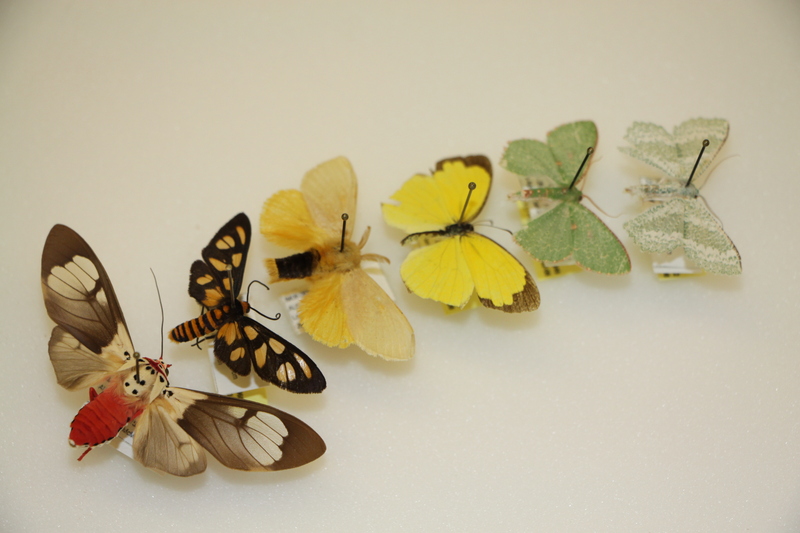 Sifting through this week’s received specimens, I had the chance to find out some interesting things about one insect order in particular: Lepidoptera. Lepidopterans are what we recognize as moths and butterflies. 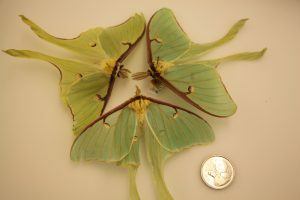 Generally, most of us know moths to be the nocturnal creatures that flutter around our porch lights in the summertime. Interestingly, not all moths are nocturnal; some moths are considered crepuscular (active during dawn and dusk) while others can have diurnal habits (only active during the day). If you have ever had the opportunity to handle a moth you may have noticed how they appear to have a small fur coat and that brushing against it leaves a smattering of dust on your hand. Surprisingly, the furriness you see is not in fact fur at all; rather, it’s a highly organized collection of long modified scales. These scales form a very delicate coat that gives moths their brilliant colouration patterns. Also, these scales may be used to help moths regulate their internal body temperature and increase their aerodynamics when flying. Brushing against this coat causes the scales to be sloughed off forming a dust. So, the next time you see one of our fine fluttering friends be sure to keep that in mind!